Gardening With Your Kids Is Great Fun | Global Garden Friends, Inc. Many of us maintain a beautiful and functional garden so we have somewhere for our kids to play during the summer. Gardens are brilliant as we know where the children are and that they will be safe and happy at all times. Rather than spend all of the time doing the gardening yourself, why not involve and teach your children many of the gardening basics that you do in order to keep their play area well maintained. Unfortunately, the really tedious stuff such as mowing the lawn probably isn’t something we should be giving our children to do, yet involving them with other gardening basics can be great fun and also give your child a serious focus around the garden and the wider home. 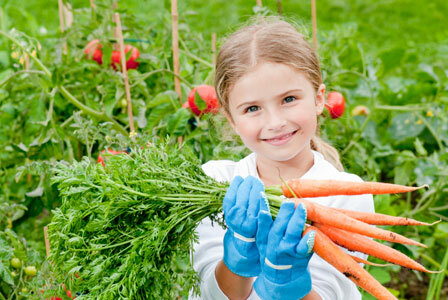 Make a big thing of getting your children involved in gardening basics. Set aside a plot of your garden for the children to be creative. Take them down to the garden centre and select a colourful plant which they find attractive, which you can place in your garden for them to look after. Even better, if your little ones have a favourite vegetable you could perhaps look at buying a packet of seeds then growing them under the watchful eye of you and your young gardener. Children will find great excitement and take great pride in their area of the garden. Particularly if you have planted seeds, watching and waiting over time while they grow into delicious carrots or other garden vegetables can be very exciting indeed. Knowing that they are looking after the plants and will get to water them after school can be very exciting, and is overall a superb way to involve your children in gardening basics early. Other simple things can also be incorporated into your child’s gardening regime. There are a number of child designed gardening tools available, from mini shovels and trowels right up to garden rakes. These ensure that your child can join you in maintaining the garden the whole year round, and as well as the fun involved for everyone it also provides a unique bonding and learning opportunity for you and your child together. Whether it is an apple tree, a colourful row of plants or a row of root vegetables, your child will have a lot of fun and look to spend a lot of time in the garden. Get them good at it now, then when they are old enough you can out your feet up and make the garden their job around the house!